One of the largest retailers in the country is a 123-year-old operation with a highly exclusive customer list—to shop at this store, you must have served in the U.S. armed forces. Despite that stipulation, the Army & Air Force Exchange Service (AAFES)—also known as the "Exchange" or the PX (an Army abbreviation for "post exchange")—has grown to become the 56th largest retailer in the country, operating some 2,700 stores on Army and Air Force bases in all 50 states and more than 30 countries worldwide. "We spent the last year and a half making changes in our DCs to handle the increase in e-commerce," said Alan French, the the Army & Air Force Exchange Service's vice president of logistics operations. The Exchange no longer does all its business through stores, however. In 2014, AAFES launched an e-commerce website in an effort to keep pace with an increasingly omnichannel world. Although that move proved popular with customers, it created problems for the back end of the operation. The Dallas-based Exchange quickly realized that its existing distribution process, which was geared toward store replenishment, would need a serious overhaul to meet the demands of e-commerce. As the volume of direct-to-consumer orders grew, it began investing in automated material handling systems. Twenty-two months ago, that process shifted into high gear when AAFES CEO Tom Shull began laying the groundwork to open up the Exchange's e-commerce business, ShopMyExchange.com, to a much wider audience. Defense officials had decided to extend online shopping privileges to all honorably discharged veterans as well as its traditional customer base of active-duty and retired service members and their families. The change expanded the ranks of potential e-commerce customers overnight to 30 million from 11 million. To handle the flood of shoppers eager to access the site's tax-free deals, the Exchange launched a major overhaul of its three main U.S. distribution centers, making changes at the various sites that included adding voice-directed picking technology, and installing new conveyors and a put-to-light wall. The keystone of the upgrade was swapping out its 30-year-old warehouse management system (WMS) for JDA Software Group Inc.'s latest WMS. The upgrade has enabled new capabilities like giving customers greater visibility into their order status, optimizing outbound shipments, and processing e-commerce orders through a shared-inventory single-WMS environment in order to cut inventory-carrying costs, Exchange officials said. Many of those upgrades are familiar strategies to any e-tailer looking to provide swift omnichannel fulfillment service at an affordable cost. However, the Exchange has many unique attributes that made its e-commerce makeover unique. Unlike niche websites that specialize in specific types of inventory, the Exchange sells a nearly universal range of goods in order to satisfy its mission "to bring troops a taste of home." It carries everything from Michael Kors sunglasses to Vera Bradley handbags to razor blades to diapers, along with dishwashers, flatscreen TVs, and saltwater fishing rods. In return, military members who have served foreign deployments thousands of miles from U.S. shores often feel a deep loyalty to the Exchange. A visit to an AAFES store in a foreign port offers a connection to American culture and community that goes far beyond checking off items on a shopping list. One former Marine interviewed for this story fondly recalls visits to "the land of the big PX" as a near-Disneyland experience—a stark contrast to the rigors of life on an active military base. For someone like him stationed a long way from home, PX privileges meant instant access to cherished items like Cheerios in Germany or a Nintendo videogame console in Panama. That relationship creates a far tighter bond between the store and its customers than you'd see with a typical big box retailer and its clients. 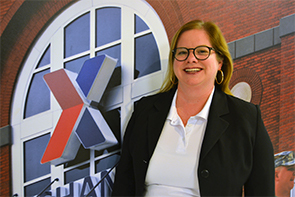 In fact, the Exchange describes its business model as "family serving family," noting that about 85 percent of its 34,000 employees are connected to the military in some way, whether they're retired veterans or National Guard or Reserve personnel themselves or the spouses and relatives of those service members. Shopping at the Exchange even supports fellow military members financially, with roughly two-thirds of earnings reinvested in programs such as Army child development and childcare centers, fitness centers, Air Force outdoor recreation programs, and school meals for warfighters' children overseas. With 2016 revenue of $8.3 billion and earnings of $384 million, the Exchange provides significant support for military families worldwide. With such a loyal following, leaders of the Exchange knew their revamped e-commerce operation had to be ready to handle a surge of orders from the first day the expanded eligibility requirements took effect. "We spent the last year and a half making changes in our DCs to handle the increase in e-commerce. 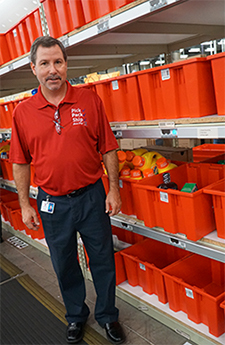 Among other things, we revamped our systems and carved out space for a consolidation area, a pack station, and a shipping area," said Alan French, the Exchange's vice president of logistics operations. The updates affected the Exchange's three main U.S. DCs: the 1.4 million-square-foot Dan Daniel Distribution Center in Newport News, Va.; the 707,000-square-foot Waco Distribution Center in Texas; and the 849,000-square-foot West Coast Distribution Center outside Sacramento, Calif., along with its satellite facility, a 240,000-square-foot building at the nearby Sharpe Army Depot. To obtain the capabilities it needed, the operation embarked on a project to upgrade its WMS software platform to JDA's WMS 2013.2 product. The Exchange has now installed the system in its West Coast and Waco facilities as well as a new distribution center in Germany. It is currently working to roll out the new WMS at its flagship DC in Newport News, according to JDA. As a result of the upgrades, the three facilities are now the most efficient of the 11 DCs operated by AAFES, according to the Exchange. That efficiency is the result of new processes enabled by the WMS. For instance, unlike the legacy system, which assigned employees to jobs based on static warehouse functions, the new software lists the tasks each worker can perform, then sets a priority for each task, compares that with a worker's proximity to the task location, and assigns jobs accordingly. The result is a more effective work flow because the system directs the closest and best-qualified workers to the tasks that are most pressing at any given moment, according to the Exchange. At the same time, the software has pulled back the curtain on the fulfillment process, giving customers greater visibility into the status of their orders. With the previous platform, customers couldn't obtain updates until the DC shipped the merchandise. But now, thanks to the implementation of a warehouse order management system (WOM), they're able to see the status of each order as it makes its way through the DC. Modernizing the WMS allowed the Exchange to make other technology updates as well, including the addition of a Vocollect voice-directed picking system from Honeywell Intelligrated. The Exchange also worked with Honeywell Intelligrated to install advanced conveyors and a put-to-light wall in its Newport News site, according to Honeywell. Honeywell Intelligrated had previously worked with the Exchange to replace the aging conveyor system in its Waco DC with a faster, higher-capacity version, Honeywell said. That new, wider accumulation conveyor at Waco also features upgraded controls that replaced dated mechanical sensors with electric sensors and servo drives, as well as a sliding shoe sorter and upgraded pick modules. Choosing commercially available material handling equipment was a novel approach for a unit of the Department of Defense, which has a reputation for buying expensive specialized hardware from defense contractors. "As a government agency, we tend to move slowly, as contracts need to be signed and then we need to get government funding," French acknowledged. "But we have the intention to upgrade quickly and make changes fast in the future. We need to use [commercial off-the-shelf] products to stay up-to-date and stay current because e-commerce is changing so quickly." When the Exchange opened the electronic doors of its website to an expanded audience last Veterans Day—Nov. 11, 2017—the orders came pouring in as expected. In fact, the number of orders placed on ShopMyExchange.com over Veterans Day weekend was nearly triple the number from the previous year, as newly eligible military shoppers logged in to take advantage of the tax-free deals and the "family connection." In raw numbers, the website logged 172,396 orders over a period that included Veterans Day weekend, Thanksgiving, Black Friday, the Saturday after Thanksgiving, and Cyber Monday, which represented a 132-percent increase from 2016 levels, according to the Exchange. Measured by units shipped, the website handled 351,175 items of inventory over that period, notching a 202-percent increase from the year before. As for how the new systems worked out, the Exchange's e-commerce operation weathered the storm, executives said. The flagship Dan Daniel facility recorded a 30.42-percent productivity increase over its performance in 2016, measured by units shipped per day, while using the same number of workers, Meeks said. "We see ourselves as very unique," said Julie Mitchell, the Exchange's public relations specialist, Executive Group (EG). "This is different from a commercial business; our customers are our family. We serve a special type of customer who raises their right hand and takes an oath to serve their nation, so we consider it a privilege and honor to serve them." Feedback: What did you think of this article? We'd like to hear from you. DC VELOCITY is committed to accuracy and clarity in the delivery of important and useful logistics and supply chain news and information. If you find anything in DC VELOCITY you feel is inaccurate or warrants further explanation, please ?Subject=Feedback - : PX, I love you">contact Chief Editor David Maloney. All comments are eligible for publication in the letters section of DC VELOCITY magazine. Please include you name and the name of the company or organization your work for.